We need action to limit pollution from oil and gas drilling. 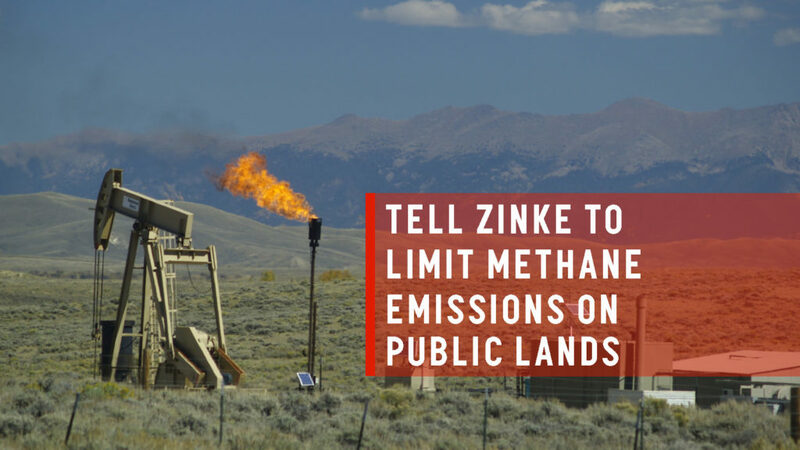 Tell Interior Secretary Ryan Zinke to keep limits on methane pollution in place on public lands! The Trump administration is once again making moves to repeal the rule restricting methane emissions that accelerate climate change. The rule would require oil and gas companies to capture methane leaks, which would reduce 180,000 tons of the emissions per year (equal to eliminating 950,000 cars on roads). The Bureau of Land Management (BLM) is taking comments on their plan to eliminate important protections against methane pollution. Together, we defeated this toxic plan before and together we can defeat it again. Last spring, the Senate voted 51-49 against an attempt to repeal the rule that would have prevented similar protections against fossil fuel emissions in the future. Special thanks to Sen. John McCain, who cast the unexpected deciding vote to keep the protections in place. Methane emissions from oil and gas drilling are a big contributor to climate change. Which is why these protections were designed to limit emissions to protect our climate, health and environment. This rule is a fundamental step toward lowering harmful greenhouse gas emissions from fossil fuel production. We need to stop drilling on public lands. We certainly shouldn’t allow more pollution from drilling on public lands. Take action, then spread the word with your friends and family: Tell Secretary Ryan Zinke to limit methane pollution! Founded at the first Earth Day with a mission to protect the planet and all of us who live on it, we are Environmental Action. We stand up to big polluters, take on the corrupt politicians and give everyone in America a chance to be an environmentalist with simple, powerful actions. Ready to take action for the planet? You're in the right place.